There’s more to Quantum of the Seas than the first-of-a-kind sky-diving simulator and dodgem cars at sea – not to mention the gimmicks such as robot bartenders and full-sized ‘virtual balconies’ in every inside cabin. Royal Caribbean’s newest ship really does promise to live up to the bold slogan This Changes Everything. 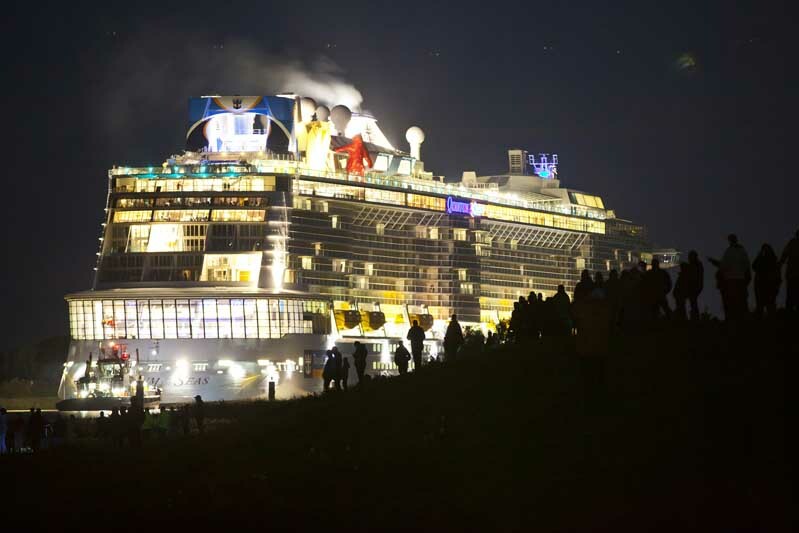 The 4,180-passenger vessel makes a brief visit to the UK at the end of October. Identical twin sister Anthem of the Seas will call Southampton its home for cruises to the Europe and the Med throughout next summer. Anthem will be in direct competition with P&O’s Britannia, launching in March and with a capacity of 3,600 passengers. Royal Caribbean chairman Richard Fain boasts: “It’s my objective to crush our competition in the UK market with Anthem. Among Royal’s latest announcements is an exclusive deal with an internet satellite network to provide more bandwith on Quantum than on all the other cruise ships in the world put together. Unlike its predecessors, which have cavernous three-storey main dining rooms, the Quantum class vessels have four big venues. There’s classic French cuisine in The Grande (where every night is formal night) comfort food in the American Icon Grill, bang up-to-date contemporary menus in Chic, and pan-Asian fusion favourites in Silk. Among the other 14 choices on board are a Jamie’s Italian and a Johnny Rockets burger bar, plus pizzas, steaks, and a combination of Mediterranean and Californian cooking in Coastal Kitchen, which is reserved for guests staying in suites. The headline show in Quantum’s main theatre is a full-length version of West End Abba musical Mamma Mia! and Anthem will get the Queen tribute We Will Rock You. 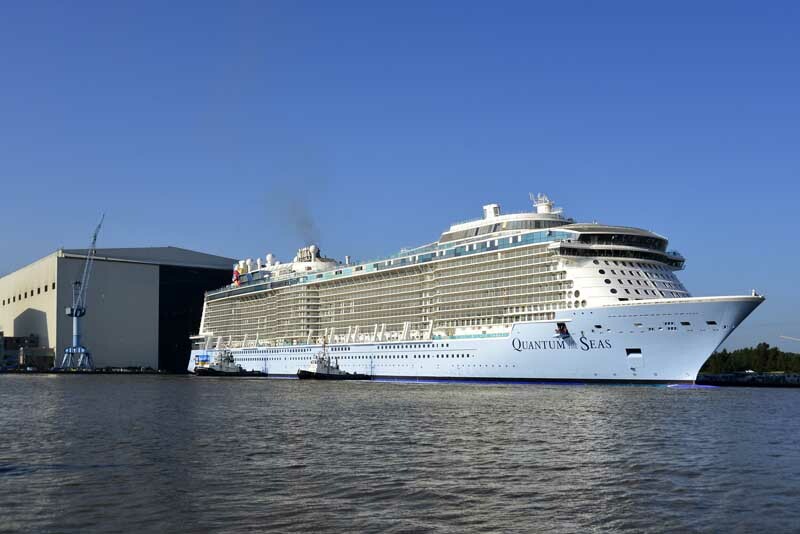 I was taken on a guided tour of Quantum before it left the shipyard in Papenburg, Germany. 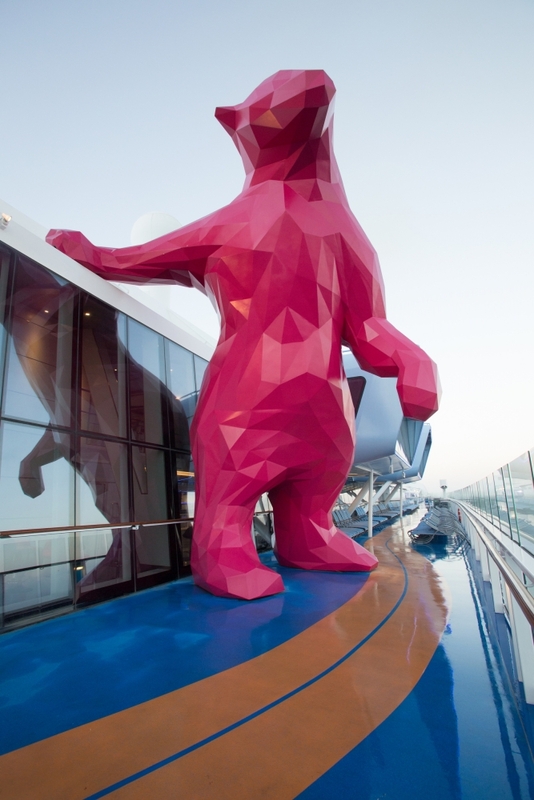 Royal Caribbean chairman Richard Fain was inordinately proud of one seemingly bizarre addition – Big Red. It’s a huge sculpture of a bear, the colour of a raspberry sorbet, and we had to walk between its legs to enter the SeaPlex complex which is home for the dodgems and also features a DJ booth on the end of a hydraulic arm, that will zoom over the heads of dacers. In concept, it’s somewhat similar to North Star – the observation pod ride that looks like it escaped from the London Eye, and which Fain hopes will not only be packed out during the day when passengers can ride for free, but will also be popular for exclusive events, even weddings. The cocktail mixologists in the Bionic Bar may be robots, but they still expect to be tipped – Royal Caribbean vice-president Lisa Lutoff Perlo assured me the money will go into the crew benevolent fund. In another high-tech move, Quantum dispenses with ordinary cruise cards for unlocking cabin doors and paying for extras around the ship – passengers get a wrist-band which contains the technology required to achieve everything remotely. They’re a bit like an Oyster card worn as a Fitbit. Tracking your luggage to see whether it has been delivered to your room needs another bit of kit – an app downloaded to your mobile phone. It will be interesting to see how many passengers can be bothered. I’m also looking forward to seeing if Royal’s promise that it will take no more than 15 minutes to get through security and check-in to board the ship is achievable. I know it works in Fort Launderdale – my arrival on Allure of the Seas was possibly even speedier – but anyone who has faced the queues and delays at Southampton might be a little sceptical. No scepticism about one more Quantum innovation though. The virtual balconies – 80-inch HD screens in inside cabins, showing the view outside the ship real time – are stunning. The idea might not be completely new (Disney introduced “virtual portholes” on Dream and Fantasy) but the execution is totally realistic. Thousands of people were hugely impressed as they gathered on the banks of the River Ems to watch Quantum make her 28-mile journey to the sea. Many thousands more will be even more amazed when they take a cruise on the ship in its maiden season.